Leading a A real Ghost Hunting or Paranormal Investigation Team takes a lot of hard work and dedication. Those of you in the know are certainly aware of this matter first hand. You have experienced the woe's of getting different people to coordinate a active search as well as deal with personality clashes and those that feel they should take over your group and be in charge. If only you had had a paranormal game plan from day one then many of your problems and frustrations would not have brought you to the point where you are today. You personally should know why your doing what your doing in hunting for real ghosts. Make sure your reasons and those of the group you form are all in agreement to the facts of why your hunting for ghosts or anything paranormal in the first place. Is it because you all want to prove something to yourselves individually. Or present it to the world that Ghost are real. That may sound simple but many people have their own agendas and reasons. Fame notoriety or just to prove to others that they are not certifiably nuts. As the new leader of any Paranormal group or Team you will be required to organize paranormal investigations and haunted location expeditions. You are someone you delegate must handle the people that contact your group to come and investigate their haunted lives. You or the group must be accessible 24/7 365 days a year. Either through the internet or how ever you decide to advertise your services. Remember you need to find the right people to join your group for ghost hunt expeditions. You also need to be a therapist in a sense to keep the team together. You also have to set up a place to keep records of investigations not only on a computer but also hard copies in actual physical files. And this is effectively the best way to keep reports of your team’s findings. Initiative and Enthusiasm: You will be constantly on the move. The leader of a Paranormal Investigation Ghost Hunting Team needs to be able to communicate with other groups. Just because your not the only ghost wranglers in town you need to be open to working with other groups. not bashing them verbally to clients or others on blogs and web sites. Are yo the sole person in the group that organizes expeditions, gathers information, and recruits new team members? Try to make it a team effort. If you do it all alone is it the personal glory your after? Organization skills are always a real plus but have yours been tested to the max? Ghost hunting groups seem to do that to people. it pushes buttons that some of you might not be able to handle. If you need to step down and put someone else in charge be honest and do it. You will always need to schedule your paranormal investigations days in advance. Try to plan accordingly and rally your team to arrive at the site ready to hunt for ghosts. Remember this is a job that you don't get paid for and if you go in with an unprofessional attitude your credibility is shot from the first introduction. Also remember the real ghosts that you will be attempting to hunt for a a persons home is watching you and your group. The ghosts might size you up from your actions and say I don't want to mess with these fools. Many groups forget the importance of health and welfare. I know of two groups that actually have scheduled gym days or work out sessions. Endurance and personal strength: Sometimes your quest for real ghosts and hauntings will take you to some very difficult out door terrain. By staying in shape, you will be able to lead your team effectively through any real ghost hunt. Consider this if you can't breath or walk more then 12 steps without having to sit down why are you hunting for ghosts? Unless your health is in check you might be haunting someone your self real soon. When forming a team one should consider peoples health issues as they apply for your groups admission. diabetics, hyper glycymic those that need special attention over a certain period of time need to state these facts openly when joining. Real questions that need to be asked... First? Also consider making up a questionnaire for would be ghost hunters joining your group. Ask questions like any health problems, mental? Physical? Also consider asking have you ever been arrested and for what? Spent time in jail? Mental institution? and so on and so on. Never let someone join your group just because they say hey I watch ghost hunters on TV all the time and I want to experience a real haunting. Meet would be prospective Ghost Hunters Eye to eye. Never judge the Character of a person over the phone . I heard about a guy from a New York Group that just gets calls from people asking to go on ghost hunts with the group and just tells them to show up at such and such a location. People will follow you if you are trustworthy, dependable, responsible and competent person. But why be so hap hazard with who you accept into your group. You don't need to have Courage to hunt for real ghosts. But let me tell you here and now. "No one wants to follow the ghost hunter who is afraid of the dark." Spiders, strange places, roaches, bats crazy people. Yes they all come along with the investigations sooner or later. And if anyone is bothered by such things don't you know about it in the first place. All these things ghosts might find out about the party on your team from observing them and just listening. Ghost know how to investigate Ghost Hunters better then we them. Anything and everything that you fear a ghost will use against you. Be aware of that right now!. Do those in your group as well as your self have good "People Skills". Remember you deal with the living clients family friends and employee's depending on the case you are investigating. Someone with a bad attitude can really make it tougher on you and all you do in the future if you let them. Intelligent Ghost hunting: Knowing where real might be haunting and searching there first will help you to find them sooner than searching indiscriminately. Having the right information is a necessity, always set up someone in your group to interview clients. Find the right people person in the group and set them as you first person to speak to clients. Also set up paper work with a lawyer that clients need to sign stating that you and your team or not responsible for damages, unwanted publicity and anything that the actual ghost might do just because you and or team came in looking for it. In ghost Hunting and Paranormal terms of the 21st Century a simple handshake is no longer enough. Your Paranormal groups honest and open "Paranormal Credibility" Is at stake always. Your group or do it yourself research must be well documented, backed by compelling evidence, and credible witnesses to be believed outside of the Paranormal community. Your personal life also comes into the microscope when anything is presented to the world publicly. Do you hang with infamous characters? Have you been to jail? Have you perjured your self in anyway? Think about who you are first of all in life and how you want the world to see you and most of all never make false claims just to make yourself and team look better. Oh and all Paranormal Investigations or confidential. Unless the party you investigated signs papers stating that you can expose their haunted problem never do with out permission in writing. When building your own Ghost Hunting Team a lot of different skills will always be necessary. As a Paranormal Groups leader you personally will have to seek out and recruit people that can fill these roles. Keep in mind that a person may fill more than one of the roles listed below and this list is by no means all-inclusive. If your a self motivated Paranormal Researcher or Investigator in the first place you know what your doing with a team or not. But everyone needs real validation. A good researcher or investigator will always call in others to interview witnesses thoroughly, extract necessary information, put information together, and make sound analytic judgments. Good people for this role are Detectives, Clergy, police officers, investigators, reporters, writers, and scientists. Becoming the Paranormal Team Leader: The team leader is the glue that holds the team together. He communicates with all the team members and gets things moving. Your Paranormal Web Sites Webmaster: The team webmaster is today an important position. As we all know they will maintain the team’s web site, post photographic, written, or forensic evidence of ra ghosts and their existence. Consider getting someone who know how to build a site. And not just someone just learning how to do it. The Interviewer: Someone needs to field calls and emails. Talk to a person and get all the details of who they are and what the haunting consist of. This person should be a people person and a good listener. And sympathetic to a persons claims no matter how strange or out there they are. The Paranormal Investigation Planner: Once the team, knows where it wants to search, the team planner looks over maps, finds a suitable location for base camp and possible search areas in the area. The paranormal Investigation Expedition Organizer: The organizer arranges any logistical needs for the team to include travel arrangements, transportation, etc. The planner and organizer work closely together during he planning of the expedition to make sure that everything has been accounted for. This individual is or should be an expert at reading maps and is familiar with the area. They personally make sure the team gets to where they want to go and gets back safely without getting lost. The Sketch Artist: A good sketch artist will be able to quickly make note and draw what the team sees if they encounter a real ghost. This will be important when completing reports. Good people for this role are sketch artists, graphic designers, etc. The Writer: The team writer will record the events of the expedition, complete reports of the team’s findings and make notes of the team’s interaction with real hauntings and ghosts along the way. Good people for this role include reporters and technical writers. You don't want someone out to make their name as a journalist or article writer for this job. Their ego's are always at the root and will sometimes embellish a haunted investigation just to be apt to sell the story. 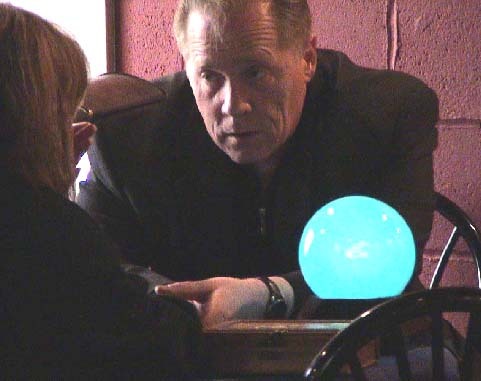 The Sensitive, Medium or Ghost Specialist: This person is the haunted ghost expert. they has read everything there is to read about real ghosts and is familiar with what his behaviors, activities, haunting patterns, favorite locations, etc might be. They have a sixth sense that at times allows them to communicate directly with spooks and specters. The Paranormal Forensics Analyst: This person will be able to carefully gather evidence and go over it personally. They often will take or collect samples of Photos, EVP's or EMF readings and put them into logical patters and order. This person will need to make arrangements to have the evidence analyzed and properly validated with logs that each member should keep. The Paranormal Equipment Wrangler: The man or woman who accounts for all equipment being in working order at all times. Buys batteries and cables and tape and any thing that you need to make sure all is in working order. Also makes sure that their is ample extra equipment in case something fails. Paranormal Evidence Analyst: Whether it be EVP"s video or photos some needs to go over the information that everyone has given them thoroughly. Each person in your group should write their report of what they perceive is a ghosts. and each person goes over what the others submit as proof. then it is given to a special team that validates and compares all the notes to look for similarities. AND GINA LANIER ASKS YOU TO PLEASE GHOST HUNT RESPONSIBLY! Alyne Pustanio's Upcoming Special Events And Personal Appearances, Lecture schedule, latest book news, and other information. Fandemonium the newest feature of the Red Stick Animation Festival. Special guest Alyne Pustanio will be there Friday Nov 12 and Saturday Nov 13. Red Stick features activities for kids of any age. ALYNE PUSTANIO IS ALSO FEATURED IN THE MOST PERFECT ULTIMATE HALLOWEEN COMPANION OF ALL TIMES!